Color borrowed from the new Corolla IM gives this Lexus a far sportier look. The Lexus CT200h was a great-looking luxury hatchback that looked like a hot hatch while offering the on-road advantages of a hybrid. Especially when built to F-Sport specifications, the CT200h perfectly fit the role of a high performance luxury hatchback, except rather than a powerful engine, Lexus went the hybrid route. It was still a great car in terms of luxury hybrids, but it definitely didn’t offer the driving dynamics of the hot hatch. Even with that in mind, some CT200h owners like to make changes that accentuate the sporty nature of this compact hybrid. One Redditor named “meesterteebs” who owns the smallest Lexus hybrid found that adding a sportier color really makes a big difference in bolstering the aggressive appearance of the now-gone CT. When the OP first introduced us to his uniquely-wrapped Lexus CT200h F-Sport, he shared the picture above with a comment that many readers are likely thinking. “Wrapped my 2016 CT 200H F Sport. Looks even hothatchier (it ain’t)”. While it really is just a simple color change, it is amazing how much sportier the CT200h looks in what is basically Blue Flame from the 2019 Toyota Corolla IM hatchback. Many Lexus vehicles, especially those with hybrid powerplants, are painted a subdued color, with lots of grey-scale, whites, browns and blacks filling the car’s exterior color palate. However, swapping to a color that Toyota currently uses definitely gives this sleek hybrid a sportier feel. It should be noted that the car isn’t actually Blue Flame, it is Avery Dennison Gloss Light Blue, for those looking to copy this upgrade themselves. While there were a handful of comments praising the OP for his choice in colors, many of the Redditors who joined in the conversation echoed the wish for more power in something like the CT200h. “Such a cool looking car, why couldn’t Lexus put their new turbo 4 cylinder in it,” said “ISF5“. “Working at a Lexus dealership we all agreed that a CT200 with the NX200 engine would have been awesome. I still hope to see somebody make that swap,” said “iugarte90“. And the OP agreed, as does pretty much everyone who has ever driven a CT200h. 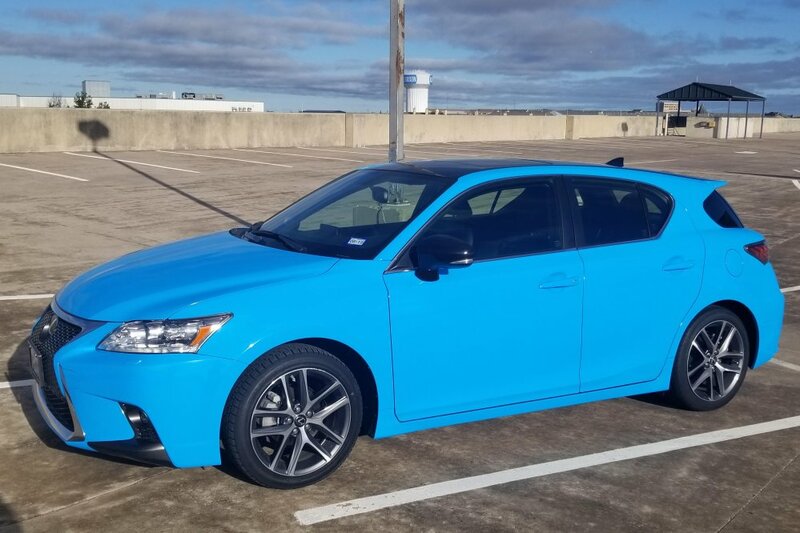 While we don’t know if the future holds a hot hatch for Lexus, there is no question that the Toyota Blue Flame exterior color looks great on the CT200h F-Sport.